Row 2 – 16 (or desired length of band): Hdc in each st across, ch 1, turn. Before fastening off, test the length making sure it is long enough by wrapping band around pouch and position end at beginning of band. 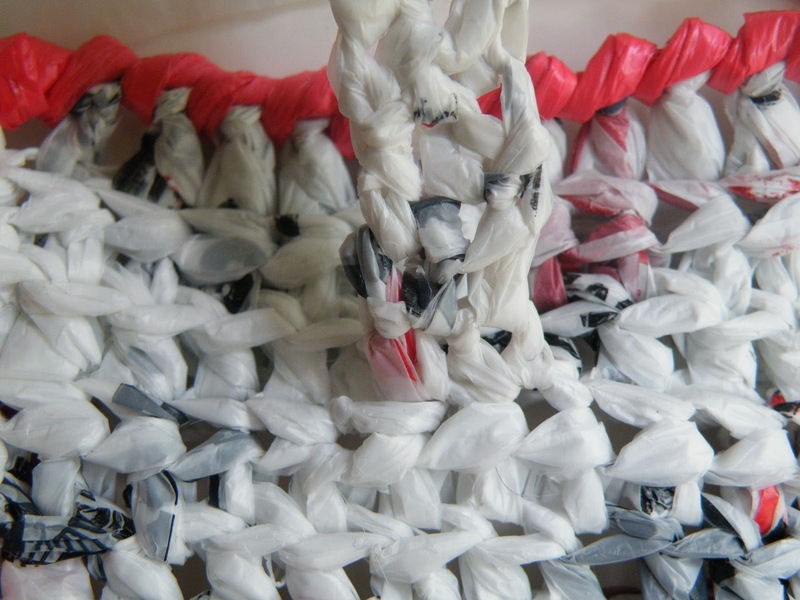 Even though plarn does stretch, you want the band a little loose so it isn’t so tight when you fill the pouch. Fasten off leaving long enough tail to st end of band to top of flap. Stitch end of band to front of flap. Round 1: With Contrasting color and H hook, using the adjustable ring method, make 7 sc in ring, join with a sl st in 1st sc. Adjustable Ring method: Make a loop as if to form a knot giving yourself about 4” to 6” of tail. 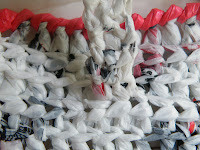 Insert hook through middle of loop (front to back), plarn over, and pull hook back through (back to front). You now should have 1 loop on your hook. Ch 1 as this will count as your first sc. (The standard is ch 1=sc; ch 2=hdc; ch 3=dc). Make the # of sts in the loop making sure to crochet around both the plastic yarn and tail. 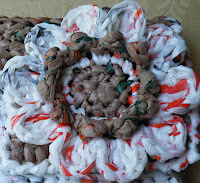 I suggest making the stitches a little loose so it will be easier to pull the plarn tail. If you start running out of tail, pull the tail to give you more slack, however, you will notice that the loop will get smaller. Now for the fun part – grab the tail and gently pull the stitches together. As you do this, the inner circle gets smaller. Round 2: 2 sc in each st around. Fasten off. Round 3: With Main Color, 2 sc in same st, 1 sc in next 2 sts.Repeat around. Do not fasten off but pull out a big enough loop so the stitch doesn’t come out as you will be coming back to it. Round 4a: With F hook and contrasting color, join with sl st in front loop of a st from Round 3 and following petal pattern: in same st-sc, hdc, sc, sl st in next petal.Repeat around. After completion of last petal, sl st behind a st of 1st petal made. Fasten off, weave in ends. Round 4b: Insert hook back into loop of round 3, follow petal pattern around: in same st - hdc, dc, 2tr, dc, hdc, sl st in next petal. Repeat around. After completion of last petal, sl st behind a st of 1st petal made. Fasten off, weave in ends. 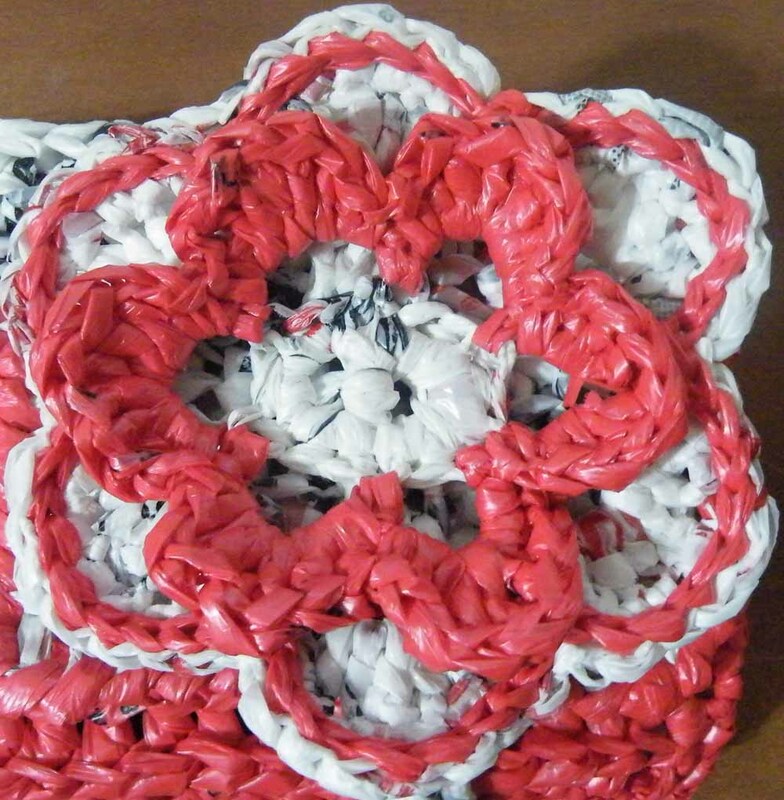 Round 1: With contrasting color and F hook, join with sl st in pop tab and make 18 sc around pop tab. Fasten off, weave in ends. Round 2: With main color and H hook, join with a sl st and sc in same st, *ch 4, sk 2 sts, sc in next st. *Repeat around. Round 3: In each ch 4 sp, follow petal pattern: sc, hdc, dc, 2tr, dc, hdc, sc. After completion of last petal, sl st behind a st of 1st petal made. Round 4: Still working behind petal, sl st to 1st tr, *ch 4, sl st in tr of next petal. *Repeat around. Fasten off, weave in ends. Round 5: With contrasting color, follow petal pattern in each ch 4 sp: *sc, hdc, dc, 3tr, dc, hdc, sc, sl st in sl st of Round 4. *Repeat around. Sl st in 1st sl made of Round 4. Fasten off, weave in ends. Join main color in front loop of a st in Round 5, sl st in each st around. Fasten off, weave in ends. Position middle of flower over band ends on top of flap, sew flower to flap. Final touch, with matching plarn and craft needle, sew remainder of I.D. pocket to flap. Let me know if you have any questions .... 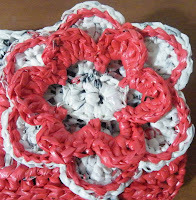 It was pleasure to offer this pattern to you and I hope you enjoyed participating in Plastique's first of many to come Crochet-Plarn Alongs. If you're ready for more fun, please join me for the next C-PAL. 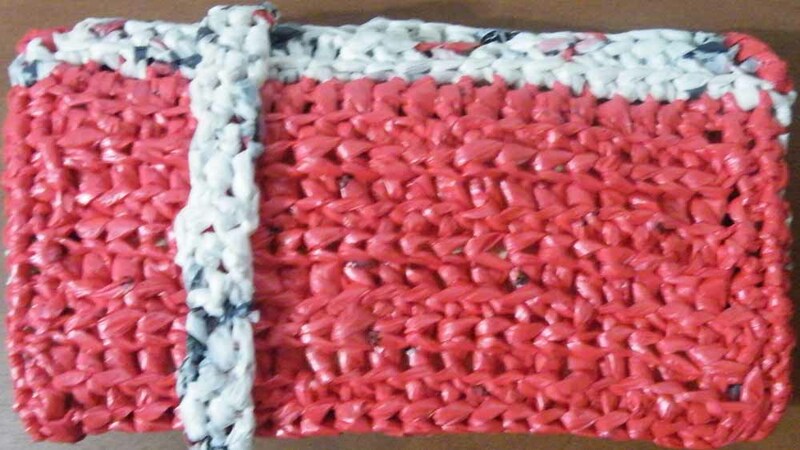 We will make a pop tab plarn bracelet.